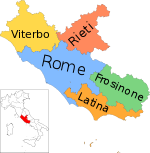 The Province o Roum (Italian: Provincia di Roma) wis ane o the five provinces o Lazio, Italy. The province o Roum wis the maist populous o Italy, an is essentially coterminous wi the Roum metropolitan aurie. Roum wis the provincial caipital. The Province o Roum existit frae 1870 tae 31 Dizember 2014. On 1 Januar 2015, it wis replacit wi a new admeenistrative aurie, the Metropolitan Ceety o Roum Caipital. The Province o Roum covers amaist ane-third o the territory o Lazio. It occupees the flat aurie o the Roman an the Tiber Valley tae the muntains an dell'Aniene Lucretili Sabini an, in addition tae the muntainous regions o the Tolfa an Monti Sabatini tae the north-wast, the aurie o the muntains Tiburtini Prenestini Simbruini an east, the aurie o the Colli Albani an the northren fuithills o the muntains, an heich Lepine Sacco valley tae the sooth-east. The wastren bundary o the province is representit bi the Tyrrhenian Sea on which spread tae aboot 130 km frae the coast near Roum frae Civitavecchia tae Torre Asturias. In the territory thare are several lochs, amaist aw o volcanic oreegin, which are concentratit in the north-wast o the muntains an Sabatini in the sooth-east o the Colli Albani. The Province o Roum is govrened bi Roum's Provincial Cooncil, which is componed bi 45 members. The Preses o the province o Roum is electit bi the fowk syn 1993 ivery 5 years an is assistit bi an executive body, the Provincial Executive. Preses an memmers o Council are electit thegither bi resident ceetizens: the coalition o the electit Preses (who needs an absolute majority in the first or seicont roond o votin) gains the three fifths o the Council's seats. The incumbement preses is Nicola Zingaretti (PD), electit on 27-28 Aprile 2008 wi the 51% o the votes on the seicont roond. This page wis last eeditit on 10 Mairch 2018, at 20:25.